VIENNA - Ihr Partner für Pragreisen und die Tschechische Republik. 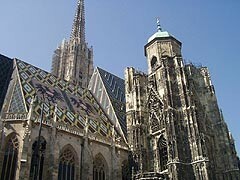 We invite you to take a trip with us to one of the UNESCO World Heritage Sites, to Vienna. This city located on the Danube River is considered to be a town of music, historical sights, museums and shopping. The journey takes about 3 1/2 hours depending on the traffic on the D1 highway. In Vienna you will arrive directly at the well-known public amusement park “Prater”. You will recognise it thanks to its famous Giant Ferris Wheel, which offers an amazing view of the city. Our bus will wait here until the evening to take you back to Prague. To get to the very city centre you will take metro line U1 from the station “Praterstern” to the station “STEPHANPLATZ” (the 3rd station in the direction of REUMANNPLATZ). If you are keen on shopping, do not forget to visit the “Mariahilfer Strasse”, which is well-known for its numerous shops and boutiques. And you should definitely take your time to taste a renowned “Sacher” cake in one of local cafés. From the city centre back to the station “Praterstern” you will take the metro line U1 in the direction of “LEOPOLDAU”. Departure from Vienna: 17:30 (5:30 pm) Arrival to Prague: approx. 22:00 (10 pm) Distance: 310 Km Please don´t forget your passport and check your visa. PAYMENT ONE DAY BEFORE.